Remember, in my after vacation come back post, I mentioned that all I did was eating and zero cooking, when I was back home in India? It was true. And, I also hoped to share recipes of some lovely food I ate then. So, this is from one such unforgettable eating experiences. While I was in Mysore, my maami (uncle’s wife) had prepared special sweets and savories to welcome the longtime visiting family, ahem, us. When she offered me a coconut burfi, at first , I was judgemental. How didfferent can a coconut burfi be? I reluctantly accepted the smallest piece quoting several reasons I could conjure at that very minute (I don’t even remember now). After the first bite, quickly followed the second and before the third, I certainly wanted more. To hell with those excuses to not eat, I thought at least for that moment. Ditto with my husband. Unashamedly, both of us were asking to see if we could have a second helping. It was so out of the world. Besides, one should never say never to great food. This was definitely not the coconut burfi that my taste buds were used to. It had a third dimension, an inexplicable depth. I knew there had to be something more than just coconut and sugar that brought in that irresistible rich taste. Before I realized, I had polished off half a dozen pieces and I was begging for more. It was a sweet sweet addiction. Having made sure to get the recipe out of the horse’s mouth, I swore to make it on my own once I got back to my cooking space and mood. Fast forward to this week. Yesterday being Vijayadashami, served as the perfect occasion for my turn. Would I succeed in churning out the same taste or would I have hiccups getting the right consistency? Only the end product would tell. Not having enough cashews in my kitchen, I had no choice but to do without them. Was it matching the taste which mesmerized me in the first place? Not verbatim (i mean taste-atim). But, most definitely this is a sweet standing tall in its own right. Another plus point, coconut is quite the frugal filler, if you are running short of almonds. 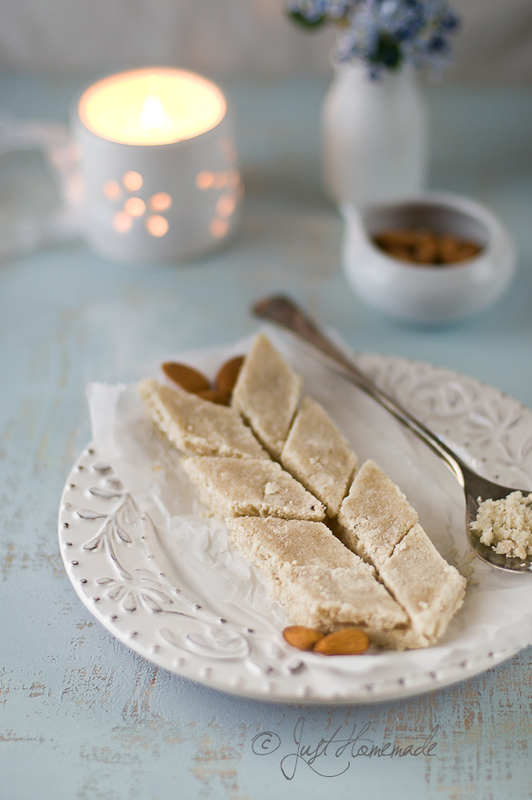 The burfi consistency for ‘doneness’ falls in between that of a plain coconut burfi and of plain almond burfi. If you have made either or both, you already know how to make this one. Even if you haven’t, let me tell you that I made it for the first time ever and got it right. So should you. Soak poppy seeds in hot water until almonds are blanched. To blanch almonds, drop almonds in boiling water and keep aside. Drain and rinse under cold water after 5 mins. Press the almonds one by one and squeeze the skin lightly to pop them out. Drain poppy seeds and empty into the grinder/mixer jar first, followed by grated coconut, blanched almonds and a couple of tablespoons of water just enough for grinding. Grind to a smooth paste. Smear in a little butter or ghee onto a flat plate or baking sheet and keep aside. Add sugar and coconut-almond paste to a heavy bottom pan. Stir to mix well over low-medium heat and proceed to stir intermittently until the mixture bubbles. Stir continuously from here onward to prevent the mixture form sticking to the pan or getting burnt, until it begins to leave the sides of the pan, lumping up as one mass, to the consistency of chapathi dough. If you tilt the pan, the mass should move from side to side and should not stick much to the ladle when you tap on it. Reduce heat to low and continue stirring for a few more minutes until the residue sticking to the sides of the pan starts to look opaque and dry, which means the consistency is nearing almost right for solidifying. Remove onto the greased plate / sheet. Working the mix like a dough with greased hands, either pat it or roll it flat into a neat square with a greased rolling-pin to 1/4 inch thickness. Smooth out the surface if needed. After 10-15 mins, when it has cooled partially, cut into 1 inch diamonds or squares with a knife. Once completely cooled, about an hour or so, separate out the burfis with a flat knife or a flat spatula and store in an airtight jar. If grating a coconut, make sure to grate leaving a layer close to the shell, to avoid the brown specks off the shell getting scraped. Use the coconut water instead of water for grinding. If after pouring onto the sheet / plate, you feel that the consistency has not been reached, take it back into the pan and stir again until the right consistency is reached. Pale brown color of the burfi is due to the cane sugar. 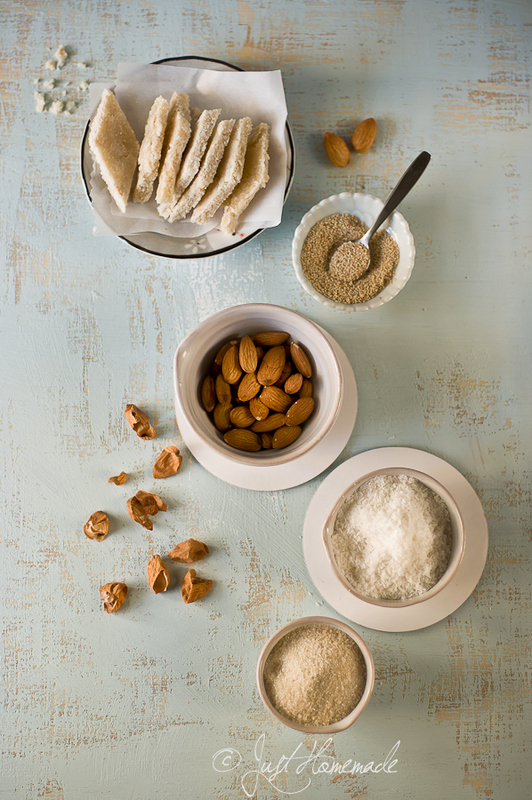 Cashews can most certainly be substituted for almonds and/or added, no soaking or blanching needed. Poppy seeds are hard to grind due to their tiny size. They grind well when soaked. 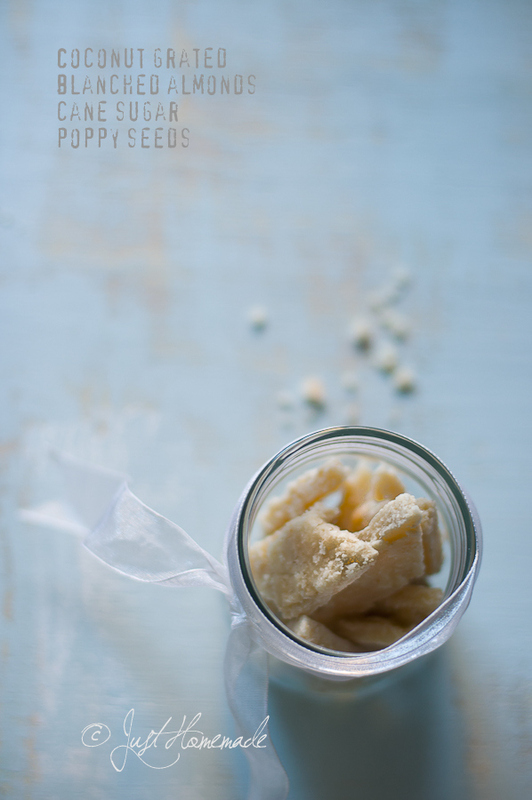 Burfi stores well up to two weeks when stored in a dry airtight container. Very interesting. 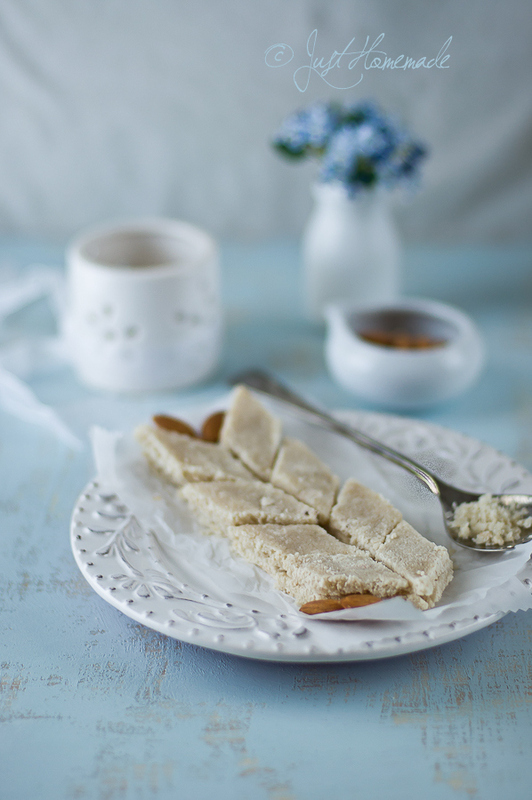 My husband and daughter are greta coconut burfi fans but I find it too sweet for my taste. I should try this variation. With cashew or almonds added to it I can imagine it getting more creamy and rich. Same here. I find coconut burfi tad too sweet for me. Addition of almonds and or cashews is such a welcome change. Thanks Ken.. Glad you like it! Even within India, it is so possible to not know about something popular in another part. It is true about foods anywhere in the world right? Wow looks yummy…and awesome combination burfi! I am a huge burfi fan. I love the addition of almonds in it. As always gorgeous clicks Radhika. Thanks Viji. Same here. Well, we might have similar tastes then! 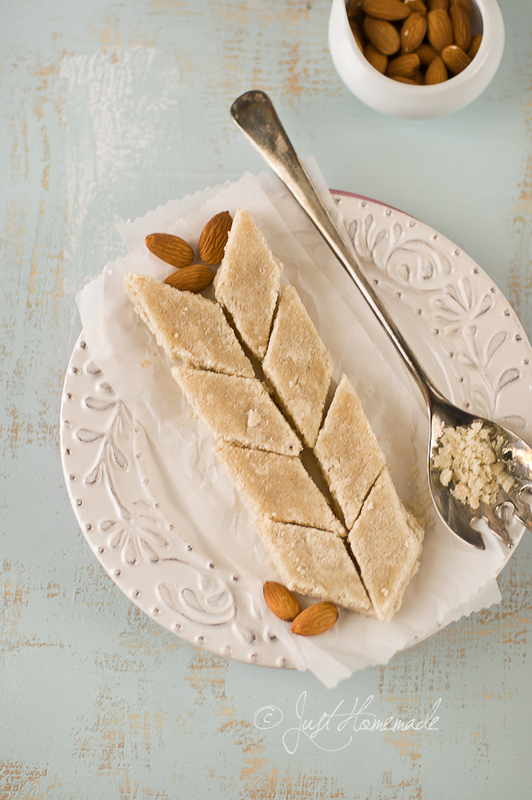 Love the addition of almonds to the coconut burfi. Amazing flavors! aah it looks delectable; i am sure of the inexplicable depth in tatse of the burfis – the pics screams dig in to me ! Honestly, I haven’t cooked with black poppy seeds, though I have read that the black (‘bluish”) ones are slightly sweeter. I feel, black poppy seeds would steal the show. To answer your question, personally, I would use only white poppy seeds or do without it. Thanks, Radhika; that’s good to know! Allisom, if it is of any help to you, White poppy seeds can be easily found in any Indian grocery store or World foods market or a mediterranean foods store. 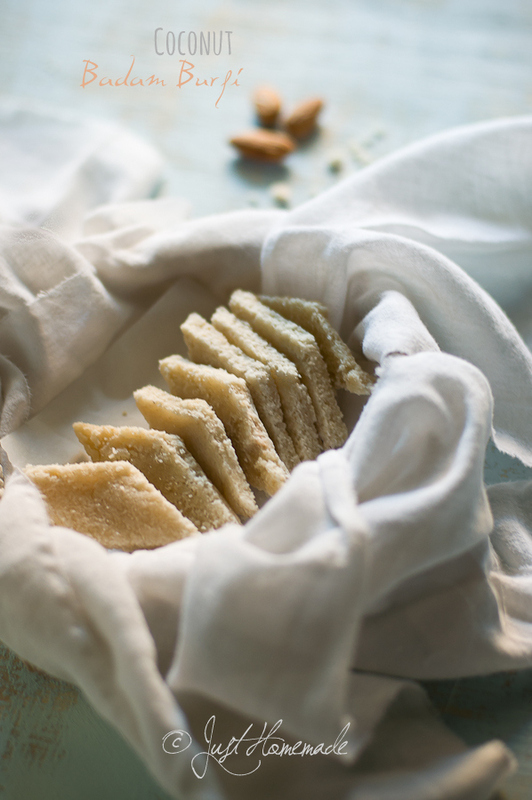 I’ve been looking for slightly healthier options for Indian desserts for the Diwali season and this looks like a great option. High-fibre and full of good fats – I’m in :). Happy Diwali to you (in advance)! Just made a batch of these burfis and they are SOOOO good! Radhika, your recipes never fail 🙂 Thank you so much for sharing these with us. Wow! thrilled to hear that! Recipes to not fail speaks much about the person cooking too, isn’t it? So so glad Chin..
I’m such a coconut lover! This recipe looks delectable! Thank you for sharing, I’ll be trying it out soon! I’m glad you like it.. Be sure to let me know when you do..
Looks absolutely delicious. I just discovered your blog and really love your photos, beautiful!